Before inviting a new dog-sitter or house-sitter to come into your home to care for your canine pals, there are several important steps you need to take prepare both your home and your pets. We have worked together with both Sainsburys Bank and Claire Williams a psychologist and dog behaviour specialist to bring you some Top Tips to help you prepare for the dog-sitter or house-sitter coming into your home to care for your dogs. It can take a little while to prepare your home for your absence, especially if the dog-sitter or house-sitter is unfamiliar with both your home and your pets. There are certain parts of your home that may be classic danger zones like the kitchen. Homeowners are often ready to keep chemicals out of easy reach, loose items and coins safely put away. However, there are many more potential dangers in the kitchen, especially for a bright and inquisitive dog who might take the opportunity of your absence to be more than usually mischievous. Sainsbury’s Bank have offered a number of images that could act as an aide memoire as you prepare your home. Keeping your washer dryer closed when not in use may seem an obvious tip, but it is surprising how often cats climb in for somewhere different to have a snooze. Be mindful of the smaller pets before you add a new load of washing. Dog food and treats – always best stored out of the way, and absolutely out of reach. Cooking Oil bottles can be tempting, so best kept in high cupboards away from temptation. Rubbish bins – it is too easy for a collection of interesting smells from food scraps to overwhelm excitable dogs, especially puppies. So best to keep the bins closed. Child proof locks can be an inexpensive way to keep all the unlockable cupboards securely shut when not needed. Foods that can be bad for dogs include: Chocolate, Caffeinated drinks, Alcohol, Grapes and raisins, Macadamia Nuts, Garlic, Onions, Avocado, Xylitol (sweetener), Cooked or small bones. Coins and loose change – Keep all coins out of reach, coins are made of zinc and are toxic to dogs. Wires for brown goods and electrical gadgets – use protective sleeves for all exposed wiring. 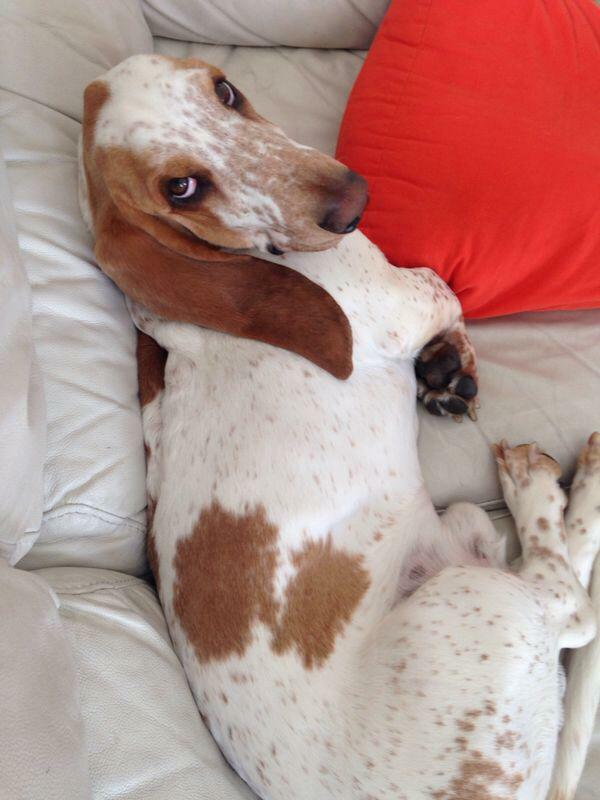 Houseplants – it is worth noting which plants can be toxic to dogs and avoiding them e.g. Philodendrons, Mistletoe, Lilies, Poinsettias. While pet owners usually manage the inside of their properties with great care to ensure their fur families are safe and out of harms way, the garden and garage offer a host of opportunities for mischief and danger, with a new dog-sitter. 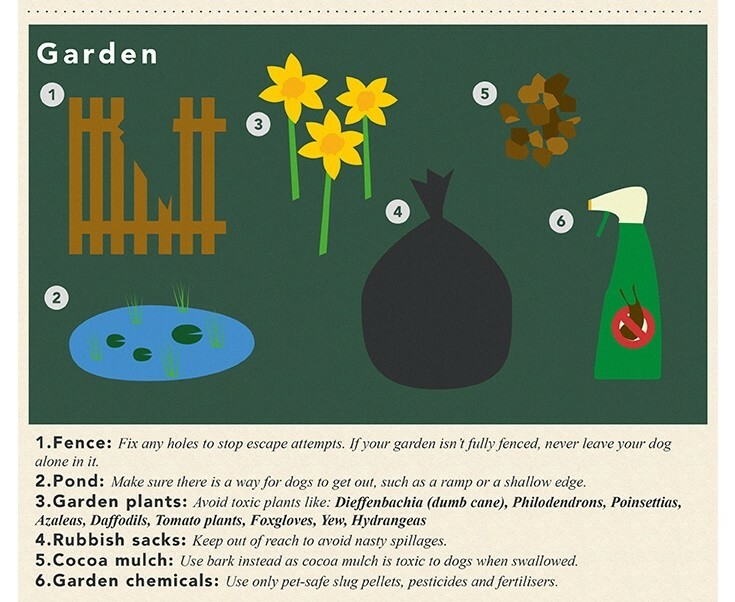 Preparations in the garden are just as important as in the home, perhaps more important in some ways, especially if the dog is allowed out unaccompanied. Fences – Make sure the fences are all repaired and in good order so that the enclosure is safe. Remember the dog may decide to go looking for you and find that loose panel you’ve been meaning to fix. Toxic Plants – Brief your dog-sitter about any ponds or water features, and make sure that the dog-sitter knows where they are located in your garden. Garden Plants – Avoid toxic plants like: Dieffenbachia (dumb cane), Philodendrons, Poinsettias, Azaleas, Daffodils, Tomato plants, Foxgloves, Yew and Hydrangeas. 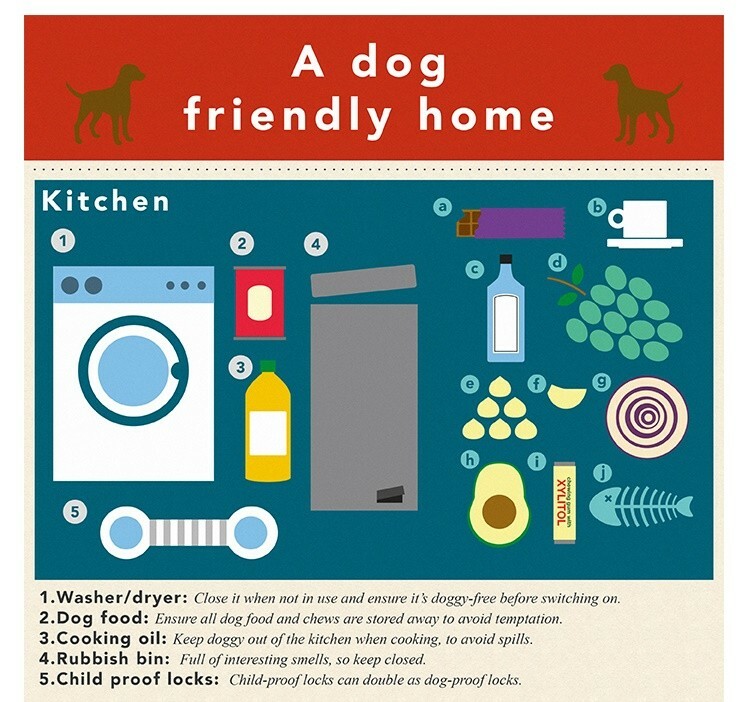 For a full view of the Sainsburys Bank the Dog Friendly Home infographic visit their website. Once you have prepared your home and made it dog friendly and as safe as you can for when you are absent, it is time to invite your dog-sitter or house-sitter to come and meet your pets. If at all possible it is key to invite your dog-sitter to your home before the house-sit to run through your routines and meet your dog. Make notes to leave with them of everything regarding feeding and toilet schedules, medication, behaviours and habits, likes/dislikes and potential stressors ( e.g. a local festival due to be held while you are away with loud music and fireworks). During this discussion ask about your sitters normal activity levels and make sure they match your dogs needs. 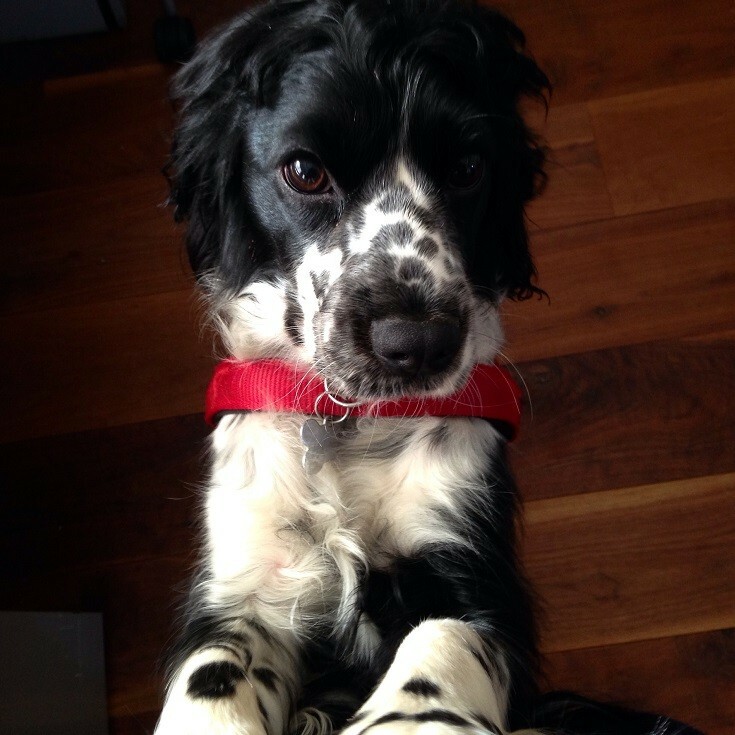 A well behaved, high energy dog that is usually exercised for over two hours everyday could become quickly frustrated and develop behaviour problems if a sitter can only manage or assumes they can give him less. Be honest about any behaviour issues, illnesses or idiosyncrasies that your dog may have, even those that may seem trivial to you, as what is normal and manageable for one person, may be viewed differently by someone else. Make sure your sitters expectations and their experience with dogs is appropriate. If your dog walks nicely on a loose leash 99.9% of the time but turns into a strong, lunging, fiend when she sees one particular dog, warn them. Give advice on what to do when certain behaviours occur so that everyone is kept safe and also that any training or work you have been doing to improve things is not unwittingly undone. Discuss with your dog-sitter how long your dog is comfortable being left alone for and how often. This is so your sitters can make realistic plans for any outings or trips to the shops etc. Their friends dog at home may be left for much longer than your dog can manage to cross his legs or refrain from chewing shoes. Aversion to visitors, postal workers and delivery people etc. Make sure that your dog-sitter will use only force free, positive reinforcement to manage your dog. People can have very different ideas, experiences and beliefs about how a dog should be controlled or disciplined so do not be afraid to discuss this with them. Let the sitter know where the best places are to exercise your dog and whether they need to avoid certain places, dogs or people to keep things calm and easy. If they plan on taking your dog in the car, does he travel well and have they got the appropriate safety harness, dog guard or travel crate? Tell your sitter what and how many treats your dog is allowed. Make sure they are aware of any allergies or other limitations (e.g. not feeding grain or carbohydrate based treats within two hours of feeding if your dog is on a raw diet to prevent upsetting the dogs stomach due to the way their digestion works). If there is a special treat (e.g. cheese) that you only reserve for emergencies such as taking medication or calling your dog away from chasing cats, then be clear about this so it doesnt loose its appeal for when it really matters. Do you have a restless puppy dog? Explain where your dog should sleep at night and where she prefers or is allowed to hang out during the day. If your dog is used to sleeping in bed with you but your sitter is unhappy about this, your dog may become upset at being relegated. Conversely, if you are strict about your dog sleeping in the kitchen but while you are away the dog gets special snuggle privileges with the dog-sitter, you might find yourself with a bit of a battle on your hands on returning. Fill your dog-sitter in on your dogs favourite activities and toys so that they can have fun and enjoy each others company. If tennis balls are the best thing ever invented, but regularly get destroyed in all the excitement, you may want to stock up. Or does your dog sleep well, but only in his special place?